Lots going on in the NHL rumour mill so you'll see shorter posts at a greater frequency for the next while. - Rumours continue to surround the New York Islanders as we get closer to free agency and the draft. The latest names to enter the rumour mill: prospect forward Michael Dal Colle and defenseman Calvin De Haan. - June 15th to 30th is the first window for NHL teams to buy out player contracts. At the top of the list of players rumoured to be getting bought out: Jarred Cowen (TOR), RJ Umberger (PHI) and Thomas Vanek (MIN). Some wonder if the Canucks might buy out one of Alex Burrows and Chris Higgins, or if they'll just bite the bullet for another year. 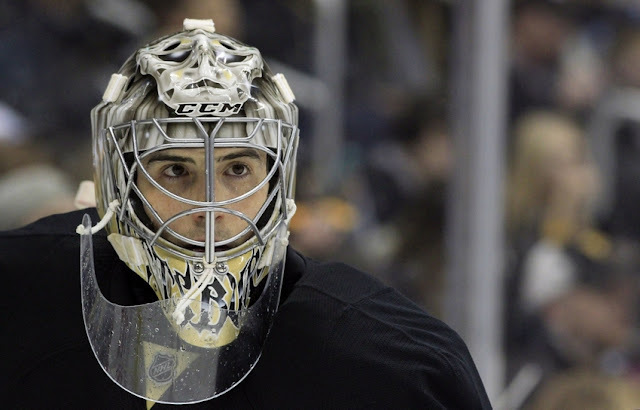 - If Penguins goalie Marc-Andre Fleury is going to be moved this summer, we're going to know soon one way or the other. The deadline for Fleury to submit his list of 12 teams he would not accept a trade to is believed to be tomorrow. This is a routine part of Fleury's contract, but it might shed some light on the likelihood of him being dealt this month. - Might the Ducks bring back pending RFA goalie Frederik Andersen on a new contract? Conventional wisdom had the Ducks trading him, but it seems pretty quiet on this front. If he's moved, this is typically a move that gets done before or during the NHL draft.